This view of the Bay Bridge in San Francisco was taken well before sunrise. I ended up liking this "vintage" version better than the sunrise image. It has a different mood with the sepia tones, as if it was photographed late at night. It feels quiet to me, without distractions, and the architecture somehow becomes more powerful. 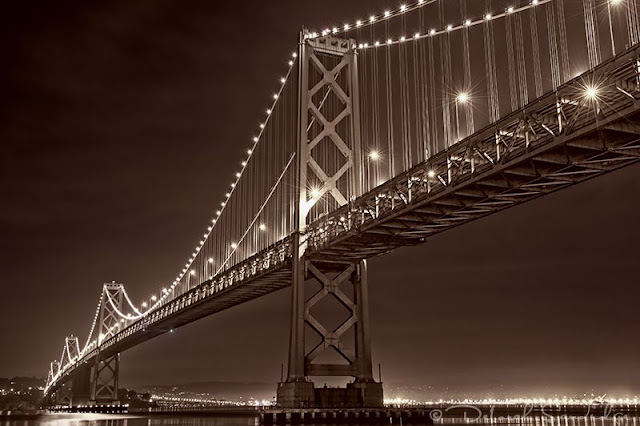 The iconic Golden Gate Bridge is beautiful, but I had more fun photographing this bridge. You'll probably see a version with textures in the future!